Ben Nevis 1996-2015, 18 years, 53.7% alc. 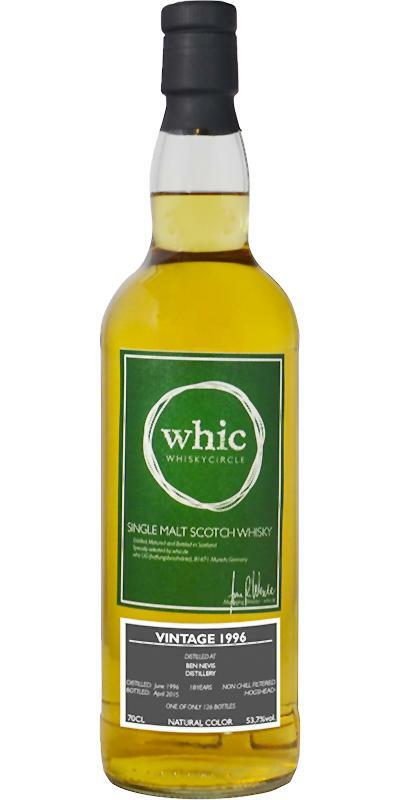 whic Ben Nevis 1996-2015, 18 years, 53.7% alc. Nose: Reminds immediately of Ben Nevis, filthy citrus fruits, unripe pears, caramel, malt and some vanilla. In addition, ripe apricots, leek and summer meadow. In the background are plastic and sauerkraut. Palate: Fatty, fruity and oily, mouth-filling and intense. Orange cream, orange marmalade, apricot liqueur, cloves, pepper, vanilla and caramel. This Ben Nevis is also very sweet, has something of syrup. Finish: Very long, very ripe. The focus is on the sweetness, the oak complements and pulls the finish slightly spicy in the length. Conclusion: A very good Ben Nevis, who scores in all categories. I thank whic.de for sample and photo! Again, a very well selected barrel that differs in a very pleasant way from the "mainstream". In addition to the classic flavors of ex-bourbon barrels, this is a great stage for the very independent distilling character of Ben Nevis. In particular, the dynamic nose of yeast, which oxidizes via cheese to fermented fruits live in the glass is exciting. Even the first nose reveals great fruitiness: apricots, white grapes, pineapple, overripe papaya. Add sugar and a lot of vanilla. There is also some caramel. Behind it lies an interesting yeast note. This first develops into hard cheese and later connects to the fruits and makes them appear fermented in a pleasant way. Now he is reminiscent of cider and honey wine. The alcohol is noticeable, but well integrated and not disturbing. In the mouth very classic for an ex-Bourbon storage. Vanilla, cream caramel, preserved fruit mix of summer fruits. Among them I find apricots, peaches and again the pineapple. An incipient oak spice brings gentle spice to the palate and sets the counterpoint to the hail sugar. Yeast or the fermenting fruit in the mouth is nothing to hear - very dynamic! The warm and creamy finish starts with dried fruit and caramelized sugar. This fruity-sweet blend is complemented by quite distinct oak. Mild pepper, a bit of bitterness on the cheeks. In between, pineapple appears again and again and brings delicate fruit acid. At the very end of the medium-long finish caramel flares up again and lays creamy in the whole mouth.